Are You Doing These 3 Types of Running Workouts? Last week, my mom and I had a really good 8 mile run. It was our last long run before the Long Branch Half Marathon (which is this weekend). Since we missed a few days due to traveling back from Paraguay (didn’t run Tuesday or Wednesday), I wanted to make it a workout as well. My inital plan was to do a 2 mile warm up, 2-3 miles at tempo pace (anywhere from 9:30-9:50), then 3ish miles at normal pace to cool down. Instead, I decided to do a 2 mile warm up, 2×2 miles at tempo pace (9:30-9:45), 2 mile cooldown. We had a 5 minute recovery period in between. This workout was tough, but I loved it! I could keep that pace for about 3/4 reps…here are our splits: 9:28, 9:33, 9:41, 10:30 (yikes). I really fell off on that last one. Clearly not ready to run those paces for any sort of long distance race, but that is why I want to keep doing this workout. For me, my weakness isn’t speed. I love track workouts and even with faster paces I have no problem completing it. My issue is endurance at a certain speed. That’s why I have not been able to improve my half marathon times. I just can’t hold a faster than comfortable pace and I end up slowing down and feeling defeated. I know I need to “get comfortable with being uncomfortable” and I know I need to do more tempo runs. Anyway, I didn’t know if you’d categorize this as a tempo workout or an interval workout…which is what led me to this post. I wanted to talk about different types of running workouts and how they can help you improve. A 20-40 run done at a pace you could sustain for an hour long race. For slower runners this may be close to your 10k pace for faster runners this would fall between your 15k and half marathon pace. For this type of tempo run, do a few miles at easy pace then 20-40 minutes at tempo pace followed by a few miles at easy pace. Tempo runs are sometimes also referred to as threshold pace runs. Dr. Jack Daniels, Olympian and renowned running coach, is a big proponent of them as well. If you haven’t read his book, Daniels’ Running Formula , you should! He outlines every type of workout, why it is beneficial, goes into the science behind everything, and gives you training plans. It is REALLY sciency, so if you like data you will like his book. Back to tempo runs…Jack Daniels is all about tempo/threshold pace runs. By running tempo runs and cruise intervals at your threshold pace, you can raise your lactate threshold. This will enable you to race faster and farther before fatigue sets in. Here’s more info on the benefits, according to him, as well as a handy pace chart. McMillan running talks about tempo runs as well, specifically Tempo Intervals. This is what I did in my run. Tempo Intervals are like fast tempo runs broken into two to four repeats with relatively short recovery jogs. The appropriate race paces for tempo intervals are 0:30:00 and 1:00:00 race pace and they should last between eight and fifteen minutes. In this case, you jog two to five minutes between each repeat then start the next one. A tempo interval workout that I’ve had particular success with is two (or three) times two miles at 0:40:00 race pace effort with three minute recovery jogs between repeats. Following a thorough warm-up, these provide a great training stimulus to prepare you for an upcoming 5K or 10K race. The effort required, the pace judgement and the mental discomfort all help immensely when race time comes. Do this workout seven to 14 days before your next 10K. Both Jack Daniels and McMillan Running emphasize this: Don’t run your workouts too fast. It is tempting to sometimes treat workouts as time trials, but it won’t benefit you. Stick to your paces in your workouts and you’ll recover faster which will lead to better times. Daniels says that go by feel instead…if a workout felt tough the first week, but in the third week it feels much easier (and you’re running the same paces, not faster), then that is how you know you are improving. This is your typical speed/track workout. My favorite day of the week is the day I get to do a track workout! I love pushing myself in these workouts, and this winter I was doing a lot of 400 repeat workouts which are my favorite. Interval pace is somewhere between your 3k and 5k race pace. Distance of each interval can vary from 200m-2000m but Jack Daniels pegs the ideal duration at 5 minutes, this being optimal for raising your VO2 Max. Interval workouts are done with rest that lasts between 50% to 100% the duration of the interval. Coach Marc would regularly prescribe track workouts for me, and in my Philly Half Marathon build up I was doing all sorts of repeats: 400s, 800s, milers, etc. For me, 800′s are the most challenging…2 laps at around 5K pace is tough! I don’t mind mile repeats because I usually do those a bit slower (more like 10K – half marathon pace). 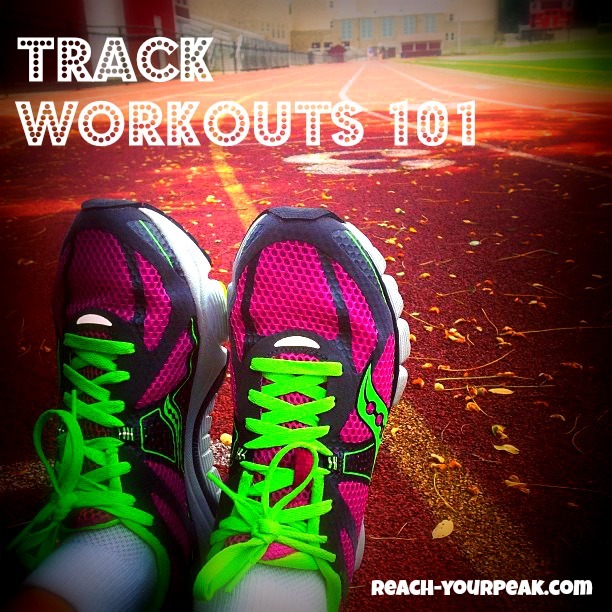 Check out my post on track workout ideas if you want to start doing more interval training. I haven’t really done much of repitition training, probably because most of the time I’m training for a longer race. Repetition training helps improve your leg turnover, and you’ll be running at faster than 5K pace. R pace is very fast training aimed to improve speed and running economy. The training is performed as short interval training, with typically 200 m, 300 m, or 400 m work outs, with full recovery intervals in between. No more than 5% of the weekly miles should be R pace. Repetitions should play an important role in everyone’s training regardless of race distance. Repetition paced intervals are done at your mile race pace +/- 5 seconds. 200 meter to 400m reps are most common but they can be done up to 800 meters..Repetitions are normally done with full rest either walking or jogging. The purpose of repetition running is to improve running economy and speed. I can remember one time where I did 200 meter repeats. I do like sprinting (or attempting to), because I feel fast…I really should throw more of this into my training. Usually my “sprints” are just striders at the end of my runs. I am not fast at all…definitely never even attempted to do shorter distances in Track & Field in high school! I’m really excited to continue training hard after this half marathon on Sunday. My mom’s friend is running it, which is why we are also running it with her. If it were up to me, I probably wouldn’t since I know I’m not fully ready, but it will be a fun run AND it is where we ran our first half marathon! But as always…we’ll see what happens. I wanted a half marathon PR last fall and that did not work out as planned. But that’s the thing with running – anything can happen, and you just have to dive back into training and keep going after your goals! What is your favorite type of running workout? Any tips for how I can “race” a half marathon? I always just end up running halfs/fulls at a comfortable pace because I’m scared of suffering in the later miles…I know I need to work on my mental strength! Just got back in from shoveling 10 or more inches of snow…and am exhausted. I usually write 2 posts a day but this morning was hectic. Right now I can’t even imagine running outside (too snowy, too icy, too cold), but it’s never too early to start thinking about track workouts! People usually run counter-clockwise. I’d say it’s okay to run clockwise but only in the outermost lanes. If you will be doing lots of laps, switch directions every few laps if there aren’t that many people. If there are faster people, run in the 2nd or 3rd lane. If you’re one of those faster people, just yell out “On your left” as you run up behind people so they will move out of your way. I’m sure everyone knows this, but each curve and each straightaway is 100 meters. A whole lap is 400 meters. 4 laps around the track is a mile. If you’ve never done a track workout, there’s no need to make it complicated. The great thing about the track is that it is a measured distance, so you know exactly how far you have gone. Always start with a good warm-up. I usually jog for half a mile to a mile before starting, and cool-down with half a mile to a mile. Run 100 meters (the straightaway) at a brisk pace (not necessarily a sprint, but faster than a run…should be comfortably hard). Repeat for however long you want to run. Run 200 meters (straightaway + curve) at a brisk pace. Once you feel comfortable here are a few workouts you can try out, depending on your goals. Shorter distances at faster speeds will be better for 5k training, and longer distances will be better for half or full marathon training. Run 400 meters (1 lap) at 5K effort. Rest for however long it took you to run 1 lap. Active rest though-walk or jog. Repeat 5-10 times depending on your abilities. Start with 5 and work your way up to 10. Run 600 meters (1.5 laps) at 5K effort. Rest for however long it took you to run 1.5 laps. Repeat 3-6 times depending on your abilities. Run 100 meters FAST (but not all out sprint-we want to preserve form here). Run 400 meters at 5K effort. Run 800 meters at 10K effort, or at a comfortable hard pace. You should be able to finish the 800 meters, and have enough in the tank to repeat it. Definitely not going all out here. Go to the track. Warm up with an easy mile or half mile. Run 1 mile as fast as you can. Cool-down. Note your time, try this next month and see if you improved. I love track workouts and can’t wait to get back to it once it gets warmer out. If you can’t make it to the track now, you can easily do these on the treadmill too. Just make sure not to choose a pace that is too fast for you, because that can lead to overstriding and injuries. Which of these do you want to try? Do you have a favorite running workout? Track? Tempo run? Fartleks?